Here’s an unpublished map of the First Bull Run battlefield, by Confederate engineer D. B. Harris. 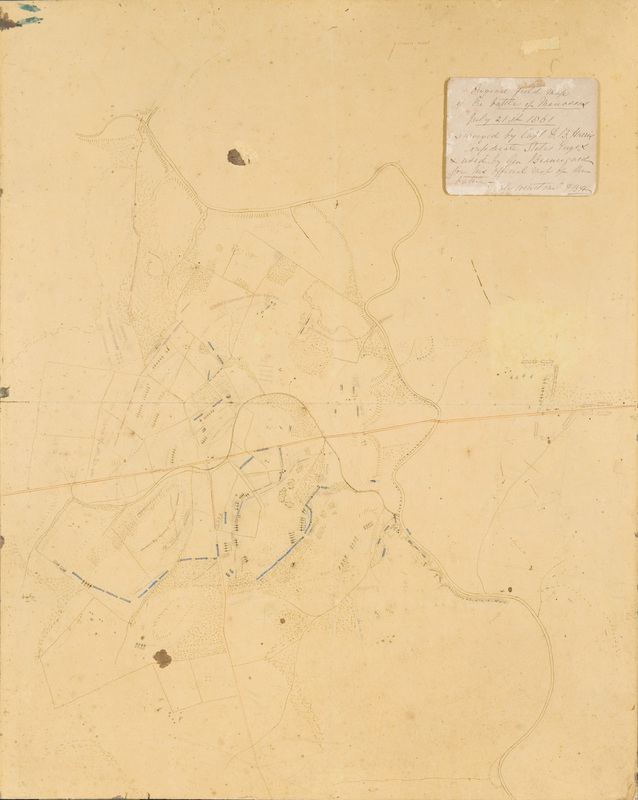 According to the notation, this sketch was used by Beauregard to prepare his map of the battlefield. It’s a recent acquisition of the Manassas National Battlefield Park and has been provided by Ranger Jim Burgess. You’ll need to use your photo viewer’s zoom to see the detail. I’ve viewed the original and it’s quite faded. It’s difficult to tell exactly what is being depicted here – for instance, is this as of a point in time or does it show movement? Look at all the guns shown north of the Warrenton Pike, for instance. Click once for a larger image. Click that image for a really large image. By sketch I mean this was made on the field and was not a final product. As noted on the map, it was surveyed, so it is more than a free-hand sketch. FYI, Confederate items are in blue. I forgot to add that that’s the best original/time of battle map I’ve seen so far for the Battle of Manassas. Other historical maps I find hard to comprehend. Harry-this is amazing. Thank you so much for posting. For a sketch, it is amazingly clear. Anyone fairly familiar to the area can see the layout well and if you have hiked over this area, some of the old roads/landmarks are immediately familiar. I appreciate you posting this and glad it is a recent acquisition to the Battlefield. Know what is the story of the engineer who rendered this map-D.B. Harris? Harry, this is probably the single most important map ever done of the First Manassas battlefield. Back in my NPS Bull Run days, we referred to it constantly. Much of the artillery on the field today conforms with this map. Thanks for sharing it. While I’d love to take credit for it, the thanks all go to Jim Burgess and the good folks at NPS Manassas NBP.